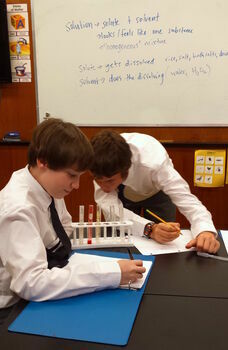 Our science program is taught in English or in French by a certified Science Teacher Specialist. The Program begins in grade one, as the kindergarten students integrate the sciences with their other curriculum content, and do so in French. The approach to the program is highly academic, but with an emphasis on exploration, experiments and hands-on learning experiences. The classes are dynamic in nature and highly engaging. Westboro Academy Science Sweeps the Regional Science Fai‍‍‍r: Nine proud students represented the school on April 8th and 9th, 2016 at the Regional Science Fair. In a phenomenal sweep of excellence, our students won prizes in 3rd place (Megan L.) , second place (Thomas C.) and two winners in first place (Ava S. and Joshua B.)! Further, we are pleased to announce that Joshua B. was selected to represent Westboro Academy with his project “Follower Robot” at the Canada-Wide National Science Fair in Montreal.